This entry was posted in Club Updates on April 3, 2017 . Each year the Chedabucto Curling rink sells 50/50 tickets to assist with its Junior Curling League and its many operational expenses. 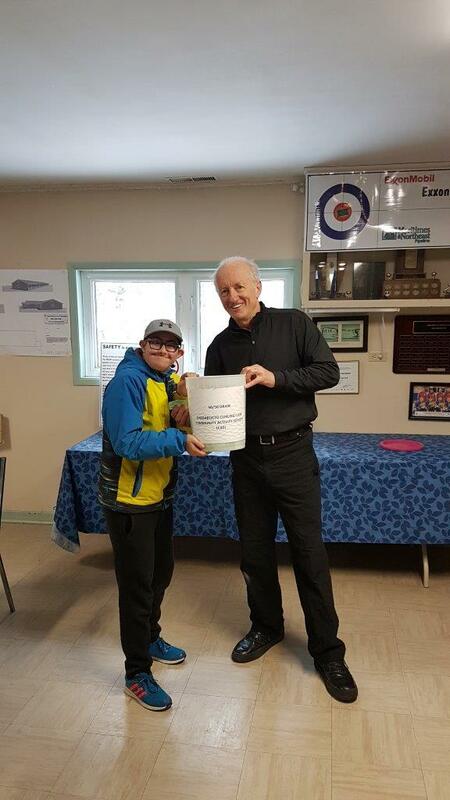 The selling of 50/50 tickets is supported by A.A. Munro Insurance with their donations of pizza certificates to the Junior League curlers as rewards for their efforts to sell the tickets. The final ticket draw of this curling season was made on April 2 with the winner of $286.00 being Anna Connolly, Guysborough Intervale. Junior League member Calum Connolly (left) assisted Ray Bates, Chedabucto Curling Club President, with the selection of this season’s concluding draw.